Dupuytren’s (du-pwe-TRANZ) Contracture (sometimes also called Dupuytren’s Disease, palmar fibromatosis or morbus Dupuytren) causes fixed flexion contractures of the hand, where fingers may fully flex into the palm, but cannot be fully extended (straightened). The condition is named after Baron Guillaume Dupuytren, the surgeon who first described the surgical correction of this condition. The condition is caused by an abnormal thickening of the connective tissue just beneath the skin known as fascia (or palmar aponeurosis). This thickening occurs in the palm and can extend into the fingers (see Figure 1). 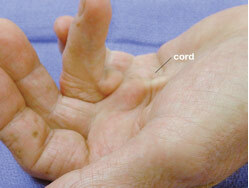 Firm cords and lumps may develop that can cause the fingers to bend into the palm (see Figure 2). The skin may become involved in the process but the deeper structures (such as the tendons) are not directly involved. Occasionally, the disease will cause thickening on top of the finger knuckles (knuckle pads), or nodules or cords within the soles of the feet (plantar fibromatosis). Scandinavian or Northern European ancestry (it has been called the “Viking disease), but also seen in some Mediterranean countries (e.g. Spain and Bosnia) and in Japan. Although unproven, Dupuytren’s Contracture has also been suggested to be associated with trauma, diabetes, alcoholism, tobacco use, liver disease and phenytoin treatments for epilepsy. While there is no conclusive evidence that hand injuries or specific occupational activities have a higher risk of developing Dupuytren’s disease, it has been suggested that the condition may be caused, or triggered by physical trauma such as manual labor or over-exertion with the hands. It is however interesting to note, that the condition does not always occur in the dominant hand, and has no correlation with right- or left-handedness. In Dupuytren’s Disease, the tough connective tissue within one’s hand becomes abnormally thick, which can cause the fingers to viagra and can result in impaired function of the fingers. The little and ring fingers are most commonly involved. In many cases, both hands are affected, although the extent of involvement may be different. Symptoms of Dupuytren’s Disease include the development of bands, cords, lumps and pits within the palm. Progression is unpredictable. Some individuals will have only small lumps or cords while others will develop severely bent fingers. Those with more severe disease may begin to experience symptoms at an earlier age. The condition usually has a gradual onset and often beginning as a tender lump in the palm. This discomfort usually resolves, and Dupuytren’s Disease is not typically painful. Over time, tough bands of tissue may develop, which are visible on the surface of the palm and may appear similar to a small callus. The lumps or nodules are become firm and adherent to the skin. As the fascial bands thicken, they form cords which extending from the palm into one or more fingers, and as these cause tethering and bending or contractures of the fingers. These are the source of the reduced mobility commonly associated with the condition. These cords may be sometimes be mistaken for tendons, but actually lie between the skin and the tendons. The disease may first be noticed because of difficulty placing the hand flat on an even surface, such as a tabletop (see Figure 3). 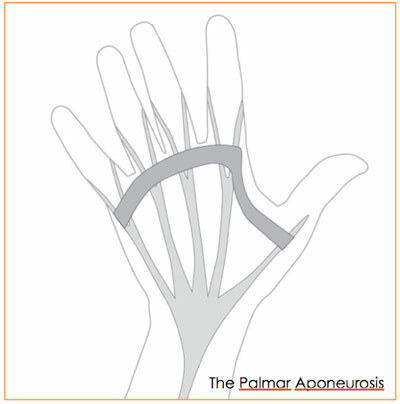 The goal of treatment in Dupuytren’s contractures is to improve finger position (allowing complete opening and closing), thereby also improving hand function. In mild cases where the disease is progressing slowly, causes no pain, and everyday hand function is not affected, only observation and regular assessment is required. On the other hand, for more severe cases, various treatment options are available to straighten the affected fingers, by removing or breaking apart the cords that are pulling your fingers in toward your palm. At your initial consultation, we will discuss the most appropriate treatments for your condition based upon the stage and pattern of the disease and which joints are involved. Before commencement of treatment, it is important to establish realistic goals, and discuss possible risks and results. It is important to note that there is no permanent way to stop or cure the condition. Despite treatment, the disease process may recur. What is important is to optimise hand function for any given stage of the disease. There are several different ways to release the contractures and straighten the fingers. These treatment options may include conservative measures (splinting), minimally invasive needling techniques (called percutaneous needle fasciotomy or needle aponeurotomy) or open surgery (fasciectomy). Surgery may be required in some cases and the need for surgery is often based on the degree of metacarpophalangeal joint (knuckle) contracture, functional difficulty and the rate of disease progression. The objective of surgery is to remove the tissue in your palm affected by the disease. This may be challenging because it’s difficult to identify tissue in very early stages of the disease. Diseased tissue may also attach to the skin, making it difficult to remove and increasing the chances of recurrence. The main advantage to surgery is that it results in a more complete joint release than that provided by the needle or enzyme methods. Physical therapy is usually needed after surgery, and the recovery time can be longer. Occasionally, skin grafts may be required to cover the wounds after extensive removal of affected tissue. This technique uses a needle, inserted through your skin, to puncture and “break” the cord of tissue that’s contracting a finger. Contractures often recur but the procedure can be repeated. Some doctors now use ultrasound to guide the needle. This might reduce the chance of accidental injury to nerves or tendons. Collagenase Injections, Radiation Therapy and Other Alternative Therapies. The US FDA has recently approved injections of an enzyme, collagenase clostridium histolyticum (Xiaflex) for the treatment of Dupuytren’s Contracture. The enzyme is injected to soften and weaken the taut cord in the palm. The physician then performs manipulation to break the cord and straighten your fingers the following day. Enzyme injections may be painful, and require multiple treatments spaced a month apart for each individual joint. These treatments, as well as radiation and other therapies are not standard treatments and are currently under investigation. Finger Stretches: Gently bend your fingers backward from your palm. One way to do this is to place your fingers on the edge of a table, palm down, and then lift the palm upward gradually as you keep your fingers flat on the table. Massage and heat: Warm up your hands with a microwavable heat pack before massaging your palms with moisturizing lanolin cream. Protecting your hands: Use gloves with heavy padding during heavy grasping tasks; and avoid tightly gripping tools by building up the handles with pipe insulation or cushion tape.